Solid Works: SolidWorks 3D CAD software’s modeling capabilities provide the power to get any mechanical design job done easily. Design data is 100% editable & relationships among parts, assemblies & drawings always stay up-to-date. Sketch to Design Techniques helps in innovated creations. SolidWorks include : SWIFT Technology, COSMOS Works, and PDM Works. 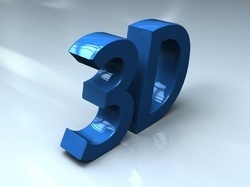 In 2D/3D computer graphics, 2D/3D modeling is the process of developing a mathematical representation of any two and three-dimensional surface of an object via specialized software.